Writing notes on the screen music "paper" is a very simple affair of positioning the cursor at the line corresponding to the note you want, and pressing a number key. Four is a quarter note, eight is an eighth note, and so on. If you make a mistake, the program's error protection alerts you and prevents the note from being entered. Notes already entered can be erased with a keystroke, and the music you have already notated can be heard at any time. Each of the four separate voices is highlighted in different colors as each note is played, like a follow-along bouncing ball. To demonstrate finished results, Music Writer has includes a dozen complete pieces of music you can read and edit. These range from a long excerpt from Tchaikovski's "Nutcracker Suite"' to Scott Joplin rags and "On Top of Old Smokey." 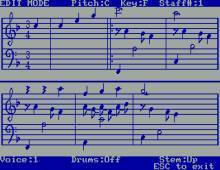 This last song is used as the basis for the program's tutorial, which quickly teaches how to operate the keyboard commands and use them to start writing music. Overall, Bank Street Music Writer is a revolutionary program that is still surprisingly playable today. It is not as intuitive or pretty to look at as EA's Music Construction Set, but it's got enough different features and user-friendly options to stand up to the best. Two thumbs up, way up!